The avant-garde French fashion house continues to push boundaries with its unique take on the traditional engagement ring. Consistently remodeling and putting a new twist on classic designs, Maison Martin Margiela focuses its attention in the ever-changing creative process of design rather than fixating on a single object. With its latest take on fine jewelry, the fashion house challenged conceptions of the classic engagement ring by re-working its Pompadour ring. While the spirit of the striking ring remains, the sapphires are replaced by an almost laser-cut split between two diamonds. 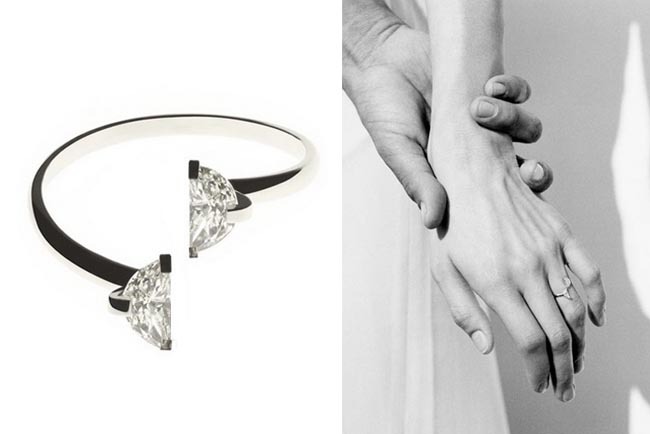 An intriguing cut with a poetic touch, as two brilliant diamonds encircle your fingers.